With the launch of its flagship Mahindra Alturas G4 SUV out of the way, Mahindra is setting up for its next product. 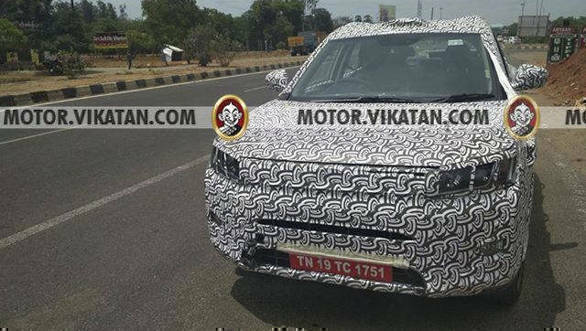 This will be the sub-four metre SUV so far code-named the S201. Come December however, we will know the nameplate under which this vehicle will be sold in India, ahead of its launch early next year. The S201 is based on the Ssangyong Tivoli and carries forward design cues from that car. While not as shapely as its to-be arch-rival the Tata Nexon, the S201 carries a boxier, more functional design like that of the Maruti Suzuki Vitara Brezza. The rectangular headlamp has projector beams and an integrated DRL while the turn indicators are pushed to the extreme end on either side. From what's visible in spy photos, the S201 will get an integrated rear spoiler and wrap-around taillights. The rear fog lamps are integrated neatly into the bumper while the multi-spoke alloys are of a size big enough to fill up the wheel wells adequately. 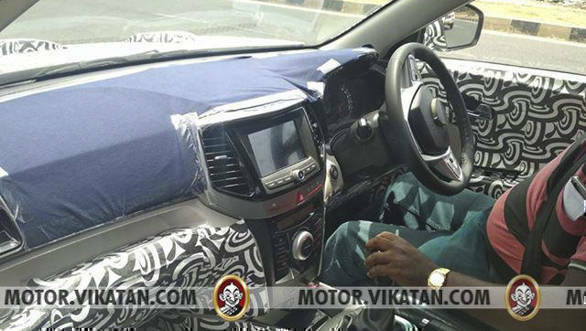 Earlier spy photos have revealed the compact SUV's interior. The interior is swathed in black and beige with silver accents. The touchscreen infotainment system is flanked by two, vertical A/C vents with a piano black bezel surrounding them. The auto climate control is located just below and has red-coloured buttons to operate various functions. A large rotary dial is placed in the centre of these row of buttons to control the fan speed. Clear influences of the XUV500 can be seen here. The Mahindra S201 will provide Mahindra with a viable product in the sub-four metre SUV category, a segment where the firm has not been adequately represented so far.